Wyrm Publishing is running a special holiday sale from now through December 15th. Prices have been reduced on almost every in-stock print book. Titles include Toast by Charles Stross (signed, ltd), Shriek by Jeff VanderMeer (signed, ltd), Tides from the New Worlds by Tobias S. Buckell (signed, ltd), Last Drink Bird Head, Realms 1 & 2, and Unplugged. A limited number of Last Drink Bird Head are signed by Jeff and Ann VanderMeer. We expect those to go fast. If you purchase two or more hardcovers, we’ll toss in a free signed limited copy of Secret Lives by Jeff VanderMeer (Prime Books, list price $35). Visit our store at http://wyrmpublishing.com. We make the contents of each issue of Clarkesworld available for free online, but the money to pay our authors has to come from somewhere. One such source is the sale of our ebook editions. This is an important part of our fund-raising efforts and one we hope to see grow as ebook devices flourish. If you get a chance, please review or star us at Amazon or B&N… or just help spread the word. Every little bit helps! The last few months have provided more than their fair share of stressful distractions. Several things have been pushed to the side or just plain ignored while I’ve dealt with those. I’m not out of the woods yet, but I’ve been making an effort to get things back on track. There is one project in Wyrm’s catalog that has had the appearance of being cursed from day one…. the signed limited edition of Toast by Charles Stross. It was originally scheduled years ago and has been tripping over deadlines ever since. The good news is that is finally in the hands of our printer. If they survive the curse and don’t burn down, I should have the books in early September. I’ll post another update when they supply the final shipping date. 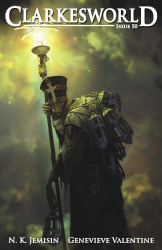 One of the other things I’ve been working on is an ebookstore for Wyrm and Clarkesworld. I think it still needs work, but I came to the realization that waiting for perfection was silly. 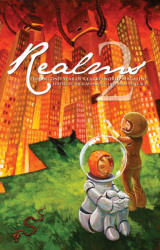 You can now order ebook editions of Realms, Last Drink Bird Head, and back issues of Clarkesworld via the Wyrm Ebookstore. At this time, Wyrm has two stores: one for print and one for ebooks. It might be a bit confusing for some people, but it actually made sense when it came to the features each cart system offered. I hope to pull them together at some point in the future. Anyhow, the ebookstore has PayPal and Google Checkout as payment options. That should cover all your needs. Once paid for, you can download your EPUB or MOBI/Kindle edition and load it onto your reader. Feedback on the ebooks or the store is very welcome.